While listening to an NPR (National Public Radio) segment about beavers, I learned that the Eurasian beaver was coming back from the brink of extinction in Europe. 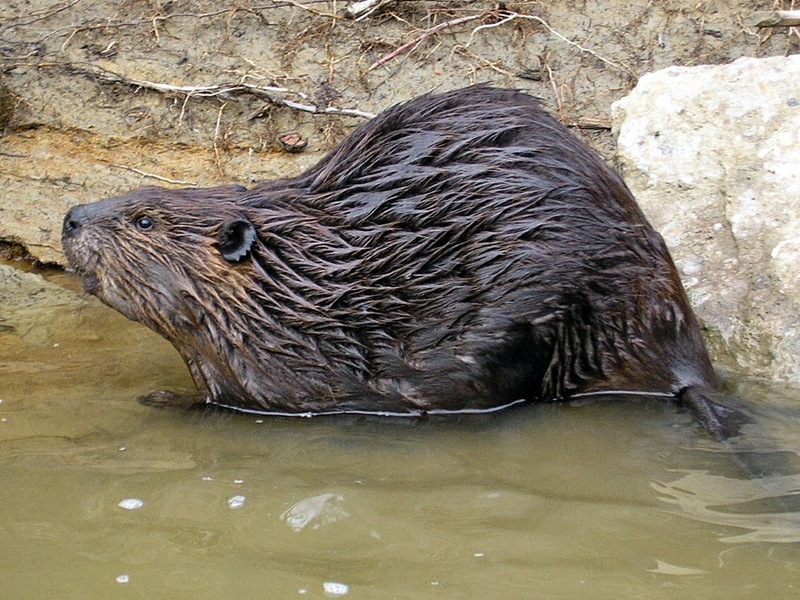 I also learned that the North American beaver is very different from the Eurasian beaver. It doesn't even have the same amount of chromosomes! 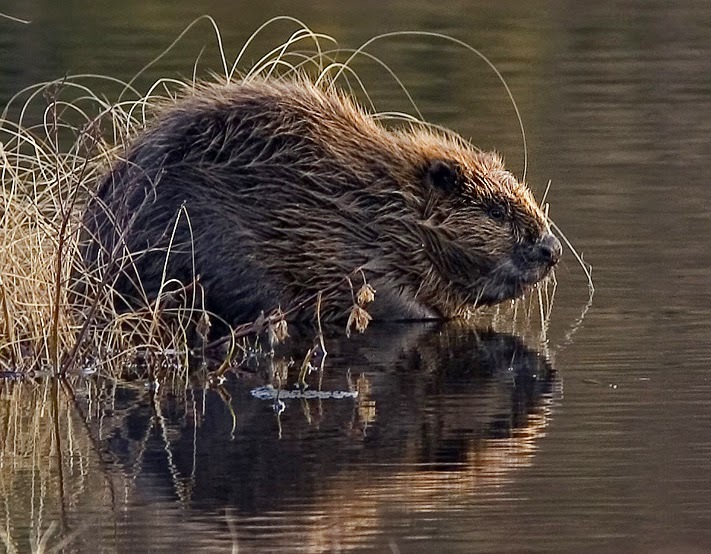 North American beavers have 40 chromosomes and Eurasian beavers have 48. As the editor of the Animals Category for the Pattern and Source Print Database of the Transferware Collectors Club, I have entered a few beaver patterns. I now assume that the beaver on the interior of the wash bowl in the Enoch Wood & Sons Sporting Series is an Eurasian beaver. It is copied from A Cabinet of Quadrupeds by John Church, which was published in 1805. The engraver is James Tookey and the artist is Julius Caesar Ibbetson. One of the pleasures of looking at patterns is finding the unexpected. 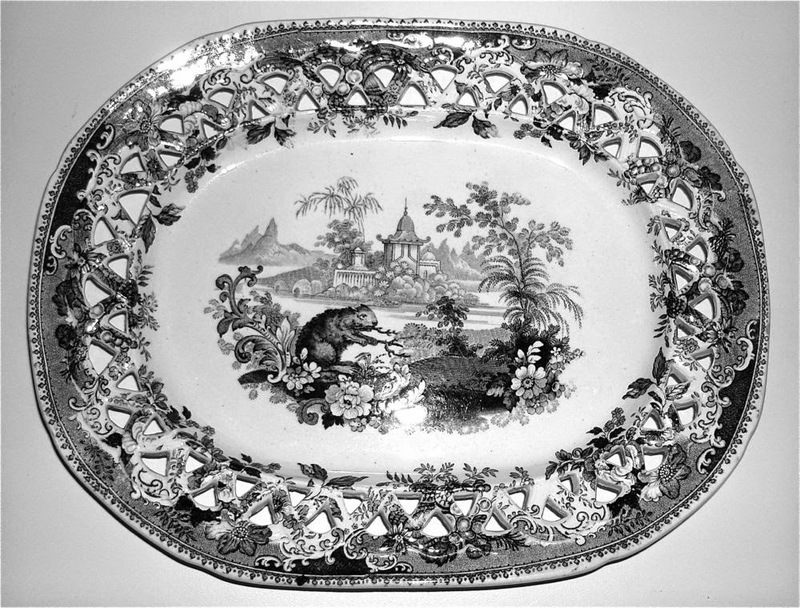 I owned a reticulated tray in the Indian Scenery series by William Hackwood (1827-1843) which featured a beaver. 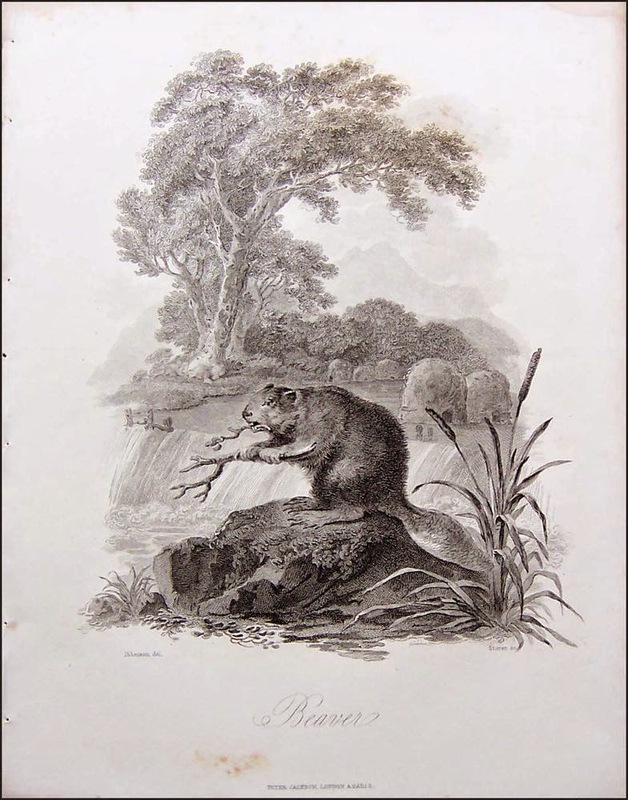 I realized that the beaver, which was nearly hidden in a Chinoiserie landscape, was copied from the same source print found above! 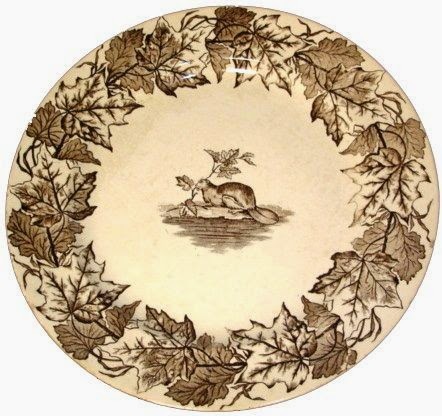 The beaver that appears in the center of the Maple pattern by Thomas Furnival & Sons (1871-1890) is probably a North American beaver, as the beaver and maple leaf are traditional symbols of Canada. I write this blog so that I can share some of the things I learn from studying transferware patterns. Beavers are very important to our planet. I suggest that you follow the links to learn more about beavers. I never heard of a rock hyrax before. 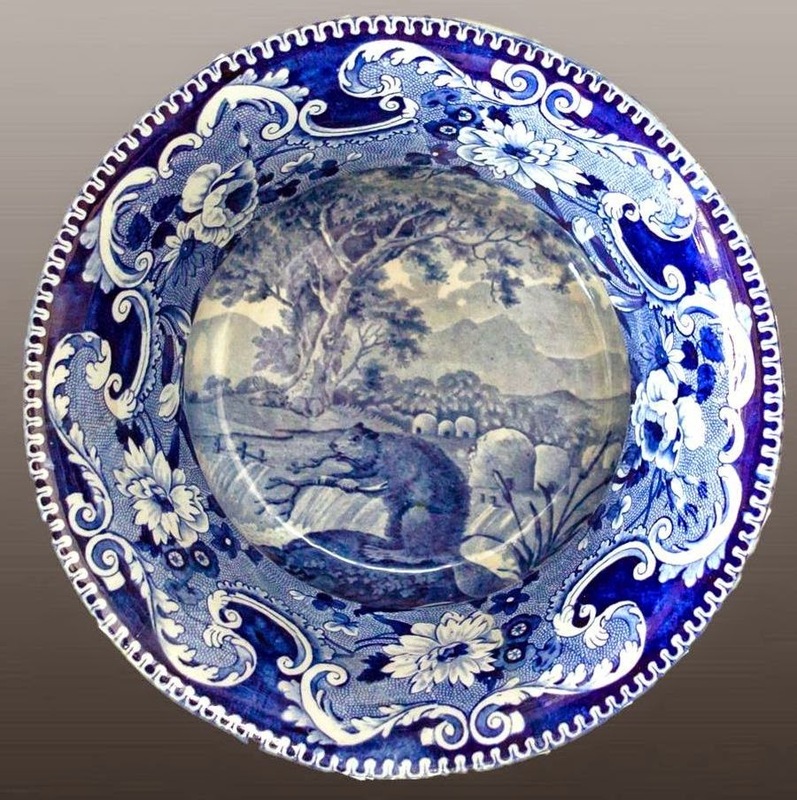 It looks similar to the Eurasian beaver on the pottery, but is quite different in reality. This is what I love about writing my blog, I learn new things!